This brilliantly striking design uses candy stripes, chevrons and polka dots to give that lovely retro look. With a sticker design to finish off perfectly. These beautiful invitations are designed and printed just for you, so we can adjust any details if you require, just let us know your specifications in the ‘Any other details’ section. Once you have placed your order, we will send you a PDF proof of your final design. 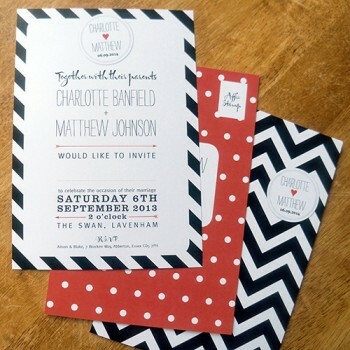 Once you’ve approved it, we will usually get your finished invitations to you within 2 weeks. If you have a more pressing deadline, we will endeavour to meet it.